This article is about the manga series. For other uses, see Case Closed (disambiguation). Case Closed, also known as Detective Conan (名探偵コナン, Meitantei Konan), is an ongoing Japanese detective manga series written and illustrated by Gosho Aoyama. It was serialized in Shogakukan's Weekly Shōnen Sunday on January 19, 1994, and has been collected into 95 tankōbon volumes as of October 18, 2018. Due to legal considerations with the name Detective Conan, the English language releases from Funimation and Viz were renamed to Case Closed. The story follows an amateur detective who was transformed into a child while investigating a mysterious organization and solves a multitude of cases while impersonating his friend's father and other characters. The series received an anime adaptation by Yomiuri Telecasting Corporation and TMS Entertainment. The anime resulted in animated feature films, original video animations, video games, audio disc releases and live action episodes. Funimation licensed the anime series for North American broadcast in 2003 under the name Case Closed with the characters given Americanized names. The anime premiered on Adult Swim but was discontinued due to low ratings. In March 2013, Funimation began streaming their licensed episodes of Case Closed; Crunchyroll simulcast them in 2014. Funimation also localized the first six Case Closed films, while Discotek Media localized the Lupin III crossover special and its film sequel. Meanwhile, the manga was localized by Viz Media, which used Funimation's changed title and character names. Shogakukan Asia made its own English language localized version of the manga which used the original title and Japanese names. The tankōbon volumes of the manga have sold over 230 million copies worldwide, making it the fourth-best-selling manga series. In 2001, the manga was awarded the 46th Shogakukan Manga Award in the shōnen category. The anime adaptation has been well received and ranked in the top twenty in Animage's polls between 1996 and 2001. In the Japanese anime television ranking, Case Closed episodes ranked in the top six on a weekly basis. Both the manga and the anime have had positive response from critics for their plot and cases. The manga has been sold in 25 countries, while the anime has been broadcast in 40 countries. Jimmy Kudo (Japanese: Shinichi Kudo) is a high school detective who sometimes works with the police to solve cases. During an investigation, he is attacked by members of a crime syndicate known as the Black Organization. They force him to ingest an experimental poison, but instead of killing him, the poison transforms him into a child. Adopting the pseudonym Conan Edogawa and keeping his true identity a secret, Kudo lives with his childhood friend Rachel Moore (Ran Mori) and her father Richard (Kogoro Mori), who is a private detective. Throughout the series, he tags along on Richard's cases, but when he is able to solve one, he uses a tranquilizer needle to put Richard to sleep, and impersonates his voice using a voice changer to reveal the solution to the case. He also enrolls in a local elementary school where he makes friends with a group of classmates who form their own Junior Detective club (Detective Boys). While he continues to dig deeper into the Black Organization, he frequently interacts with a variety of characters, including his professor friend Dr. Agasa, Ran's friend Serena (Sonoko), a fellow teenage detective Harley Hartwell (Heiji Hattori), various police detectives from different regions, and Kaito Kid. 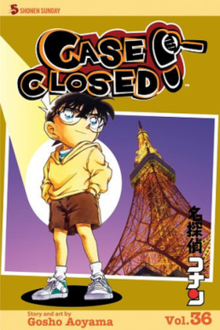 Case Closed was conceived in 1994, during the rise of mystery genre manga due to the publishing of the series The Kindaichi Case Files; the first chapter appeared in Shogakukan's Weekly Shōnen Sunday on January 19. Aoyama cites the stories of Arsène Lupin, Sherlock Holmes and the samurai films by Akira Kurosawa as influences on his work. When scripting each chapter, he ensures the dialogue remains simple and spends an average of four hours for each new case and twelve for more complicated ones. Each case spans several chapters (except for a handful of shorter cases that only span one), and is resolved at the end where characters explain the details of their solutions in simple terms; a database consisting of all the cases from the manga was launched in 2007. Case Closed became the 21st longest running manga series with over 1000 chapters released in Japan. The individual chapters are collected into tankōbon volumes by Shogakukan; the first volume was released on June 18, 1994. Gosho Aoyama's assistants have also written an anthology series of Case Closed which are released irregularly. A spin-off manga series illustrated by Takahiro Arai, with supervision by Aoyama, entitled Detective Conan: Zero's Tea Time (名探偵コナン ゼロの日常, Meitantei Konan Zero No Nichijō), started in issue #24 of Weekly Shōnen Sunday on May 9, 2018. The story centers on the agent Toru Amuro. Shogakukan Asia publishes the manga in English language in Southeast Asia since January 2019. The anime version of Case Closed is produced by Yomiuri Telecasting Corporation and TMS Entertainment. Over 900 episodes have aired in Japan since the anime's premiere on January 8, 1996, making it the sixteenth longest anime series to date. Initially, Shogakukan collected and released the episodes on VHS video cassettes between June 1996, and October 2006. Four hundred and twenty-six episodes were released on VHS until Shogakukan abandoned the format and switched over to DVDs, starting over from the first episode. For the fifteenth anniversary of the anime series, the series was made available for video on demand. Case Closed was later broadcast in North America on NHK's cable network TV Japan. Crunchyroll began simulcasting the series in October 2014. In 2003, the first 104 episodes were licensed by Funimation for distribution in North America, under the title Case Closed because of legal considerations. The Case Closed anime has also been released in other languages such as French, German and Italian. Case Closed debuted on Cartoon Network as part of their Adult Swim programming block on May 24, 2004; no more than 50 episodes were licensed from Funimation due to low ratings. The Canadian channel YTV picked up the Case Closed series and broadcast 22 episodes between April 7, 2006, and September 2, 2006, before taking it off the air. Funimation made the series available with the launch of the Funimation Channel in November 2005; it was temporary available on Colours TV during its syndication with the Funimation Channel. Funimation lost the rights to the series in 2018. A separate English adaptation of the series by Animax Asia premiered in the Philippines on January 18, 2006, under the name Detective Conan. Because Animax were unable to obtain further TV broadcast rights, their version comprised only 52 episodes. The series continued with reruns until August 7, 2006, when it was removed from the station. The California-based channel United Television Broadcasting (UTB) aired Detective Conan with English subtitles from 2011 until 2014, until episode 421. Funimation also released DVDs of their dubbed series beginning August 24, 2004. Initially, the releases were done in single DVDs and future episodes were released in seasonal boxes; 130 episodes have been released in total. The seasonal boxes were later re-released in redesigned boxes called Viridian edition. Funimation began streaming Case Closed episodes in March 2013. Hanabee Entertainment licensed the series for distribution in Australia. In January 2016, 52 episodes of the anime appeared on Netflix, initially under its original title Detective Conan before changing to its English moniker Case Closed. The episodes are listed as "season one", although in reality they are episodes #748 to #799. The episodes are only available in Japanese, but are subtitled. The availability is likely part of Netflix's efforts to expand its anime catalog. As of 2018, the Detective Conan anime has been broadcast in 40 countries around the world. Twenty-two feature films based on the Case Closed series have been released. They are animated by TMS Entertainment and produced by Yomiuri Telecasting Corporation, Nippon Television, ShoPro, and Toho. The first seven were directed by Kenji Kodama, films 8–15 were directed by Yasuichiro Yamamoto, and films 16 and onwards have been directed by Kobun Shizuno. The films have been released in April of each year, starting in 1997 with the first film, Case Closed: The Time Bombed Skyscraper. The 22nd film, Detective Conan: Zero the Enforcer was released on April 13, 2018. The second film and onwards were the top twenty grossing anime films in Japan. The revenue earned from the films funded Toho's other film projects. Each film was adapted into two film comics which were released in the fourth quarter of the same year. Funimation released English dubbed versions of the first six films on Region 1 DVDs between October 3, 2006, and February 16, 2010. Two original video animations (OVA) series were produced by TMS Entertainment, Nippon Television, and Yomiuri Telecasting Corporation. The OVA series Shōnen Sunday Original Animation are yearly mail order episodes available to subscribers of Weekly Shōnen Sunday. The first Shōnen Sunday Original Animation was available in Weekly Shōnen Sunday's 26th issue in 2000, with eleven OVAs released as of 2011. The first nine episodes of the OVA series were later encapsulated into four DVD volumes titled Secret Files and were released between March 24, 2006, and April 9, 2010. The second OVA series, entitled Magic File, consists of yearly direct-to-DVD releases. The first Magic File was released on April 11, 2007, and contained four episodes from the anime series. The subsequent Magic File OVAs contained an original plot with background ties related to their respective Case Closed theatrical films, beginning with the twelfth film Detective Conan: Full Score of Fear. A two-hour television special titled Lupin the 3rd vs. Detective Conan (ルパン三世VS名探偵コナン, Rupan Sansei Vāsasu Meitantei Konan) was produced by TMS Entertainment, Nippon Television, and Yomiuri Telecasting Corporation and aired on March 27, 2009. It was first announced in the 9th issue of Weekly Shōnen Sunday in 2009. The plot follows Kudo as he investigates the death of the Queen of Vespania while Arsène Lupin III from the Lupin III series attempts to steal the Queen's crown. The special earned a household record rating of 19.5 in Japan. VAP released the special on DVD and Blu-ray Disc on July 24, 2009. The special is followed by Lupin the 3rd vs. Detective Conan: The Movie which takes place after the television special. Case Closed's expansion into the video games industry followed behind its foray into animation. On December 27, 1996, Detective Conan: Chika Yuuenchi Satsujin Jiken was released for the Game Boy. Since then, 20 games have been released with Detective Conan: Kako Kara no Zensōkyoku Prelude set for Spring of 2012 for the Nintendo DS and PlayStation Portable. Currently, the majority of the games have only been released in Japan, though Nobilis has localized Case Closed: The Mirapolis Investigation for the PAL region. All dedicated Detective Conan games released for the Game Boy, Sony's consoles, the WonderSwan, and the Nintendo DS have been developed by Bandai. Banpresto developed the Case Closed titles on the Game Boy Color and Game Boy Advance while Marvelous Entertainment developed Case Closed: The Mirapolis Investigation. Katsuo Ono composed and arranged the music in the Case Closed animation; his works have been released on several CDs. Two image albums, comprising several songs sung by Japanese voice actors of the characters in the animation, were also released. Several theme music were performed by pop musicians such as B'z, Zard, and Garnet Crow. The first four theme music were released by Universal Music Group and all releases thereafter were by Being Inc. The Best of Detective Conan and The Best of Detective Conan 2 albums collectively sold over 2.2 million copies, while singles from The Best of Detective Conan 3 collectively sold over 1.6 million copies. On July 25, 2017, the singer Mai Kuraki was awarded a Guinness World Record for singing the most theme songs in a single anime series, having sung 21 songs for Detective Conan, starting with her hit song "Secret of My Heart" (2000). Four live action drama TV specials and a TV series were created by Yomiuri Telecasting Corporation and TMS entertainment based on the series. The first two specials aired in 2006 and 2007 featuring Shun Oguri portraying the teenage Jimmy Kudo and Tomoka Kurokawa as Rachel Moore. The third and fourth TV specials aired in 2011 and 2012 featuring Junpei Mizobata as Jimmy and Shioli Kutsuna as Rachel. The cast used for those TV specials were used for the television series which aired between July 7, 2011 and September 29, 2011. In celebration of the 50th anniversary of Weekly Shōnen Sunday and Weekly Shōnen Magazine, the two companies collaborated to publish twelve biweekly magazines consisting of chapters from Weekly Shōnen Sunday's Case Closed and Weekly Shōnen Magazine's Kindaichi Case Files. The magazine ran between April 10, 2008, and September 25, 2008. Shogakukan have also produced many books spun off from the series. Fifty volumes of a film comic series were published in Japan between June 1996 and August 2000, covering the first 143 episodes of the anime, though some episodes were skipped. Five additional film comics entitled 5 Juuyou Shorui (5重要書類, lit. 5 Important Documents) were published between July 2001 and January 2002 and covered selected episodes between 162–219. Thirteen official guide books were published between June 1997 and April 2009. Shogakukan has also published novels, digest books, educational books, and puzzle books. In North America, Score Entertainment published the Case Closed Trading Card Game on June 29, 2005. The game entails the use of three customized decks of cards, which players buy and collect. Representing characters, events, and objects in Case Closed, these cards are used by players to fulfill certain conditions to solve a case and win the game. Certain cards are used to foil the progress of the player's opponents. An English unofficial guidebook to the series titled The Case Closed Casebook: An Essential Guide was published by DH Publishing Inc. on March 25, 2008. Universal Cool Japan 2018 is being added to Universal Studios Japan with the popular anime series Case Closed. Starting January 19, 2018 through June 24, the anime series will be on the event as a form of a new “Real Dasshutsu Game” entitled Detective Conan: The Escape. In this game, fans will have the opportunity to join Conan in the upcoming Case Closed escape game at Universal Cool Japan 2018. Anime fans can expect bigger live performances, more perplexing puzzles and best of all, they will get a chance to be part of an original story in the Case Closed universe. The Case Closed manga has sold over 200 million volumes in the world, making it the fourth best-selling manga series, having been sold in 25 countries. In Japan, individual volumes frequently appear on the lists of best-selling manga. Case Closed was the 19th best selling manga in 2011, with 2,120,091 copies sold. Nikkei Entertainment magazine published a list of top 50 manga creators by sales since January 2010, in its September 2011 issue; Gosho Aoyama, the author of Case Closed was ranked 16th, with 3,320,000 copies sold. It was the 17th best selling manga in 2012, with 2,430,572 copies sold. In 2013 Case Closed became the 24th best selling manga, with 1,966,206 copies sold. It won the 46th Shogakukan Manga Award for the shōnen category in 2001, and respondents in an online poll for Japanese citizens in their mid-twenties voted Case Closed as one of the top three manga they wanted to continue running in publication. The first volume of Case Closed appeared thrice in the top ten selling lists, right after its premiere, the same volume has also appeared in the Diamond Comic Distributors's ranking list. Later-published volumes have appeared on the New York Times Manga Best Sellers lists. In France, the series was nominated for the Angoulême Festival Graphic Novel award among the Japanese selection. In the United States, Case Closed received praises from Mania. com's Eduardo M. Chavez and IGN's A. E. Sparrow for its stories—telling the mysteries and how they were unfolded by the investigations of Conan and gang. Sparrow called the style of the series a mix of Scooby-Doo and Sherlock Holmes, while Chavez believed the manga had appeal to readers of all ages. The series ranked on About.com's top continuing manga series of 2010, under the title "Best Underappreciated Gem: Shonen" category. The animated adaptation of the series was also popular in Japan, appearing in the top six of Japanese TV Rankings at various times. The television series ranked among the top twenty in polls conducted by anime magazine Animage from 1996 to 2001. It also placed better than twenty-third in polls for the Top 100 anime conducted by Japanese television network TV Asahi in 2005–06. The series received considerable airtime in China; it was the second most broadcast animation there in 2004. Several of the franchise's films were nominated for awards in their home country. The ninth film was nominated for the feature film category at the 5th Annual Tokyo Anime Awards, and the next five films were nominees for the Japan Academy Prize for Animation of the Year in their respective years of release. Melissa Sternenberg from THEM Anime Reviews reviewed and praised its animation and plot. ActiveAnime's reviewers commented on complex character design and the "spirit" that the series has, indicating that fans of serialized mystery shows would rather enjoy it. The series is also said to better suit the more matured audience. In the United States, the dubbed series faced several negative reactions toward its changes to localize the content for North American audiences. Jeffrey Harris of IGN found it pointless to change the names of the characters, and Anime News Network's Carl Kimlinger said that the changes of certain Japanese cultural references rendered several parts of the mysteries and their investigation illogical. The voice-overs proved to be a mixed bag for Carlo Santos, who reviewed the first DVD release of Case Closed for Anime News Network; he said that while the main characters sounded like "real people", the secondary ones "[came] off as caricatures". Lori Lancaster of Mania.com described Case Closed as "a clever series that had mysteries at every corner", noting the "bizarre" and "interesting" nature of each case. IGN's Chris Wyatt was positive to the manner the cases were set up, relating them to Agatha Christie's locked-room mysteries. He described the series as "Inspector Gadget meets Law & Order but in an anime style." His colleague, Harris, however, expressed annoyance with repetitive elements in the show and the contrived methods the series uses to keep Conan's identity a secret from certain characters. In 2006, the Japanese government used Conan in campaigns to help promote crime awareness among children. Targeting the same audience, Japan's Ministry of Foreign Affairs used Conan and his friends in two pamphlets: one to promote the ministry's mission, the other to introduce the 34th G8 summit held in the country in 2010. Several characters in the series featured in the sixth installment of the Anime, Heroes and Heroines commemorative stamp series issued by Japan Post in 2006. Aoyama and his creations are celebrated in his hometown Hokuei, Tottori; a museum with exhibits of his work is located there, and several bronze statues of Jimmy Kudo, Conan Edogawa, and Rachel Moore are installed in various locations throughout the town. It also has other tourist attractions related to Detective Conan, including a Detective Conan themed airport and train station, and it is promoted as Conan Town. Licensed merchandise based on Detective Conan are sold in Asia. In Japan, Detective Conan licensed merchandise sold ¥2.89 billion in 2003, ¥17.29 billion during 2005–2008, and ¥9.03 billion during 2010–2012, adding up to at least ¥29.21 billion ($366.09 million) sold in Japan between 2003 and 2012. In 2018, Detective Conan caught the attention of American late night talk show host Conan O'Brien, who discussed the character Detective Conan as well as Conan Town in his talk show Conan, and visited the town in September 2018. ^ "Official Website for Case Closed". Viz Media. Retrieved October 27, 2017. ^ a b c "Case Closed FAQ". Funimation. Archived from the original on March 27, 2004. Retrieved October 3, 2010. ^ Aoyama, Gosho (September 7, 2004). "File 2". Case Closed. 1. Viz Media. p. 44. ISBN 1-59116-327-7. ^ Aoyama, Gosho (September 7, 2004). "File 2". Case Closed. 1. Viz Media. pp. 56–57. ISBN 1-59116-327-7. ^ Aoyama, Gosho (January 17, 1998). "File 8. コードネーム・シェリー" [File 8. Code Name Sherry]. 名探偵 コナン [Detective Conan] (in Japanese). Volume 18. Shogakukan. ISBN 4-09-125048-3. ^ Aoyama, Gosho (July 18, 2007). "File 7. 姉弟" [File 7. Older Sister and Younger Brother]. 名探偵 コナン [Detective Conan] (in Japanese). Volume 58. Shogakukan. ISBN 978-4-09-121155-2. ^ a b ｢名探偵コナン、最終回の構想できている｣ [Detective Conan's ending made] (in Japanese). Sankei Shimbun. October 2, 2010. Archived from the original on February 12, 2008. Retrieved December 3, 2010. ^ Furukawa, Takuya; Gene, Tim (March 25, 2008). The Case Closed Casebook: An Essential Guide. DH Publishing. ISBN 1-932897-30-5. ^ "1st issue of Case Closed". Weekly Shōnen Sunday (in Japanese). Shogakukan. 1994 (5). ^ "Detective Conan Official manga website" (in Japanese). Shogakukan. Archived from the original on June 2, 2011. Retrieved June 11, 2009. ^ "Case Closed- Profiles". Viz Media. Archived from the original on June 13, 2009. Retrieved June 12, 2009. ^ "Sankei Shimbun interview translated". Anime News Network. October 2, 2010. Retrieved December 3, 2010. ^ Amano, Masanao; Wiedemann, Julius (September 2004). Manga Design. Volume 1. Taschen. ISBN 978-3-8228-2591-4. ^ "Database Opens for Every Detective Conan's Case Closed". Anime News Network. May 29, 2007. Archived from the original on April 10, 2009. Retrieved May 5, 2009. ^ "Detective Conan database" (in Japanese). Shogakukan. Retrieved November 28, 2010. ^ "Detective Conan Vol. 1" (in Japanese). Shogakukan. Archived from the original on January 3, 2011. Retrieved June 11, 2009. ^ "Detective Conan Special Edition 1" (in Japanese). Shogakukan. Archived from the original on January 3, 2011. Retrieved June 4, 2010. ^ "Detective Conan Special Edition 38" (in Japanese). Shogakukan. Retrieved August 20, 2010. ^ "Viz announces new manga for Q3". Anime News Network. June 2, 2004. Retrieved November 28, 2010. ^ "Case Closed Manga Names to Change". Anime News Network. June 28, 2004. Retrieved November 28, 2010. ^ "Case Closed Vol. 1". Viz Media. Retrieved November 1, 2013. ^ "Digital Case Closed Vol. 1". Viz Media. Retrieved November 1, 2013. ^ 《名侦探柯南》1 [Detective Conan Vol 1] (in Chinese). Changchun Publishing House. Archived from the original on July 23, 2011. Retrieved December 10, 2010. ^ "Détective Conan" (in French). Kana. Archived from the original on January 3, 2011. Retrieved November 28, 2010. ^ "Detektiv Conan" (in German). Egmont Manga & Anime. Archived from the original on March 22, 2011. Retrieved November 28, 2010. ^ "Detektif Conan 57" (in Indonesian). Elex Media Komputindo. Archived from the original on January 3, 2011. Retrieved December 9, 2010. ^ Baker, Bayleigh (April 10, 2018). "Detective Conan Gets Spinoff Manga Centering on Tōru Amuro". Anime News Network. Retrieved November 18, 2018. ^ Pineda, Rafael Antonio (December 30, 2018). "Shogakukan Asia to Release Zero's Tea Time Manga in English in January". Anime News Network. Retrieved December 30, 2018. ^ a b "Detective Conan staff" (in Japanese). Yomiuri Telecasting Corporation. Retrieved April 13, 2009. ^ "Detective Conan". TMS Entertainment. Archived from the original on August 10, 2011. Retrieved December 9, 2010. ^ "YTV: Animation on the Web" (in Japanese). Yomiuri Telecasting Corporation. February 18, 2010. Archived from the original on March 29, 2011. Retrieved March 29, 2011. ^ "Detective Conan episode archive" (in Japanese). Yomiuri Telecasting Corporation. Retrieved December 5, 2010. ^ "Detective Conan Volume 1 (VHS)" (in Japanese). Amazon.co.jp. Retrieved March 26, 2011. ^ "Detective Conan 14-10 (VHS)" (in Japanese). Tsutaya.co.jp. Retrieved March 26, 2011. ^ "Detective Conan Part 1" (in Japanese). Being Inc. Retrieved December 8, 2012. ^ Conan Blog (October 27, 2010). 祝! !15周年 [Celebrate! 15th anniversary] (in Japanese). Yomiuri Telecasting Corporation. Archived from the original on January 3, 2011. Retrieved November 27, 2010. ^ "Detective Conan Video on Demand" (in Japanese). Yomiuri Telecasting Corporation. Archived from the original on April 4, 2011. Retrieved November 27, 2010. ^ "TV Japan Cartoon/Anime". NHK. Archived from the original on January 30, 2011. Retrieved January 29, 2011. ^ Luster, Joseph (October 10, 2014). "Crunchyroll Adds Case Closed to Anime Simulcasts". Crunchyroll. Retrieved November 2, 2014. ^ "Funimation Confirms Detective Conan". Anime News Network. July 5, 2003. Retrieved November 28, 2010. ^ "Detective Conan by AB International" (in French). AB International. Archived from the original on January 12, 2011. Retrieved March 31, 2011. ^ "Detective Conan by M4E" (in German). M4E. Archived from the original on October 4, 2013. Retrieved March 31, 2011. ^ "Detective Conan". Mediaset. Archived from the original on March 31, 2011. Retrieved March 31, 2011. ^ "Cartoon Network Upcoming Premieres". Anime News Network. April 18, 2004. Retrieved May 5, 2009. ^ "Adult Swim Anime Plans". Anime News Network. January 22, 2005. Retrieved May 5, 2009. ^ "Case Closed – Anime on YTV". YTV. Archived from the original on May 13, 2006. Retrieved April 13, 2009. ^ Brian Hanson (April 8, 2006). "The Click April 8th – April 14th". Anime News Network. Retrieved December 5, 2010. ^ Hanson, Brian (August 26, 2006). "The Click August 26th – September 1st". Anime News Network. Retrieved December 5, 2010. ^ "Funimation Channel". Funimation. Archived from the original on November 24, 2005. Retrieved December 5, 2010. ^ "Funimation Channel Debuts On Dish Network & LA 18". ICv2.com. June 7, 2006. Archived from the original on January 3, 2011. Retrieved December 5, 2010. ^ "Funimation's Case Closed, Kenichi the Mightiest Disciple Licenses Expire". Anime News Network. May 4, 2018. Retrieved July 28, 2018. ^ "Detective Conan on Animax Asia". Animax Asia. Archived from the original on June 19, 2007. Retrieved December 5, 2010. ^ "Animax Philippines schedule (January 2006)" (PDF). Animax Asia. Archived from the original (PDF) on January 13, 2006. Retrieved December 5, 2010. ^ "Animax FAQ". AXN Asia. Archived from the original on December 5, 2010. Retrieved December 5, 2010. ^ "Animax Philippines schedule (May 2006)" (PDF). Animax Asia. Archived from the original (PDF) on May 21, 2006. Retrieved December 5, 2010. ^ "Case Closed 2: Deadly Illusions". Barnes & Noble. Retrieved May 5, 2009. ^ "Case Closed Season 5 Box Set". Barnes & Noble. Retrieved November 28, 2010. ^ "Case Closed Season 1 DVD Box Set (Hyb) – Viridian Collection". The Right Stuf International. Archived from the original on January 3, 2011. Retrieved November 28, 2010. ^ "Case Closed Season 5 DVD Box Set (Hyb) – Viridian Collection". The Right Stuf International. Archived from the original on January 3, 2011. Retrieved August 2, 2016. ^ Michelle (April 2, 2013). "Watch Case Closed Online!". Funimation. Retrieved April 14, 2013. ^ "Hanabee Entertainment Licenses Case Closed". Anime News Network. November 16, 2013. Retrieved December 4, 2013. ^ "Netflix Adds Detective Conan Anime Streaming". Anime News Network. January 1, 2016. Retrieved September 3, 2017. ^ a b "Detective Conan: Behind the scenes". CNC News. CNC. June 2, 2018. ^ "Detective Conan: The Lost Ship in the Sky" (in Japanese). Toho. Archived from the original on September 25, 2010. Retrieved September 25, 2010. ^ "Detective Conan movie archives" (in Japanese). Conan-movie.jp. Archived from the original on January 18, 2012. Retrieved March 29, 2011. ^ "Highest grossing movies of 1998 in Japan" (in Japanese). Motion Picture Producers Association of Japan. Archived from the original on December 15, 2009. Retrieved May 13, 2008. ^ "Highest grossing movies of 2011 in Japan". Motion Picture Producers Association of Japan. Retrieved July 9, 2012. ^ Berra, John (June 1, 2010). "Contemporary Blockbuster". Directory of World Cinema: Japan. Intellect Ltd. ISBN 978-1-84150-335-6. ^ "Detective Conan Movie: The Time-Bombed Skyscraper Part 1" (in Japanese). Shogakukan. Archived from the original on January 3, 2011. Retrieved February 21, 2010. ^ "Detective Conan Movie: The Lost Ship in the Sky Part 2" (in Japanese). Shogakukan. Archived from the original on January 3, 2011. Retrieved January 2, 2011. ^ "Case Closed: The Time Bombed Skyscraper - The Movie". Barnes & Noble. Retrieved November 28, 2010. ^ "Case Closed Movie 6: The Phantom of Baker Street DVD (Hyb)". The Right Stuf International. Archived from the original on September 8, 2012. Retrieved September 25, 2010. ^ "New Conan vs. Kaitō Kid story in mail-away offer to readers". Anime News Network. Retrieved June 17, 2010. ^ "11 OVAs are available in 26th issue in 2000 as of 2011". Weekly Shōnen Sunday (in Japanese). Shogakukan. 2000 (46). ^ "『名探偵コナン』特製DVD ～ロンドンからの㊙指令～特製DVD ～ロンドンからの㊙指令～" [Detective Conan Special DVD: The Secret Order from London] (in Japanese). Shogakukan. Archived from the original on April 14, 2011. Retrieved April 14, 2011. ^ "名探偵コナン Secret File 1" [Detective Conan Secret File 1] (in Japanese). Toho. Archived from the original on January 8, 2011. Retrieved January 7, 2011. ^ "名探偵コナン Secret File 4" [Detective Conan Secret File 4] (in Japanese). Toho. Archived from the original on January 8, 2011. Retrieved January 7, 2011. ^ "名探偵コナン Magic File" [Detective Conan Magic File] (in Japanese). Visionare Corporation. Archived from the original on June 5, 2008. Retrieved January 8, 2011. ^ "名探偵コナン Magic File 2" [Detective Conan Magic File 2] (in Japanese). Visionare Corporation. Retrieved January 8, 2011. ^ "Lupin the 3rd vs. Detective Conan" (in Japanese). Nippon Television. Archived from the original on January 8, 2011. Retrieved January 30, 2009. ^ "9th issue of Weekly Shõnen Sunday in 2009". Weekly Shōnen Sunday (in Japanese). Shogakukan. 2009 (9). ^ "Japanese Anime TV Ranking, March 23–29". Anime News Network. April 6, 2009. Retrieved January 9, 2011. ^ "Lupin III vs. Detective Conan (DVD)" (in Japanese). Amazon.co.jp. Retrieved March 8, 2010. ^ "Lupin III vs. Detective Conan (Blu-Ray)" (in Japanese). Amazon.co.jp. Retrieved March 8, 2010. ^ a b "Detective Conan: Chika". GameSpot. Archived from the original on January 3, 2011. Retrieved February 3, 2010. ^ "Detective Conan: Prelude from the Past official website" (in Japanese). Namco Bandai Holdings. Retrieved March 9, 2012. ^ a b "Case Closed: Mirapolis Investigation". IGN. Archived from the original on January 3, 2011. Retrieved February 3, 2010. ^ 名探偵コナン 〜夕暮れの皇女〜 [Detective Conan: Twilight Princess] (in Japanese). Bandai. Archived from the original on January 3, 2011. Retrieved February 3, 2010. ^ 名探偵コナン 最高の相棒 [Detective Conan: Best Partner] (in Japanese). Bandai. Retrieved February 3, 2010. ^ 名探偵コナン 大英帝国の遺産 [Detective Conan: Legacy of the British Empire] (in Japanese). Bandai. Archived from the original on January 3, 2011. Retrieved February 3, 2010. ^ "Detective Conan: Detective Trainer". IGN. Retrieved February 3, 2010. ^ "Detective Conan 1: Kakakuri Jin Satsujin Jiken". IGN. Archived from the original on March 7, 2012. Retrieved February 3, 2010. ^ "Detective Conan: Nerai Wareta Tantei". IGN. Archived from the original on March 7, 2012. Retrieved February 3, 2010. ^ ｢名探偵コナン｣オリジナル・サウンドトラック 4〜急げ!少年探偵団〜 [Detective Conan Original Soundtrack 4 (Let's Go! Detective Boys)] (in Japanese). MSN. Archived from the original on January 3, 2011. Retrieved November 28, 2010. ^ 名探偵コナンオリジナル サウンドトラック スーパーベスト 2 [Detective Conan: Original Soundtrack Super Best 2] (in Japanese). Universal Music Group. Archived from the original on January 3, 2011. Retrieved November 28, 2010. ^ "Detective Conan TV Original Soundtrack Selection Best". Neowing.co.jp. Archived from the original on October 13, 2012. Retrieved November 28, 2010. ^ "ぼくがいる〜TVアニメ｢名探偵コナン｣イメージソングアルバム" [Detective Conan Image Song Album] (in Japanese). Amazon.co.jp. Archived from the original on January 3, 2011. Retrieved September 25, 2010. ^ 名探偵コナン・キャラクター・ソング集 帝丹小学校に全員集合!! [Detective Conan All Character Best Songs in School] (in Japanese). Amazon.co.jp. Archived from the original on January 3, 2011. Retrieved September 25, 2010. ^ "胸がドキドキ (Single)" [My Heart Pounds] (in Japanese). Amazon.co.jp. Archived from the original on January 2, 2011. Retrieved December 2, 2010. "Feel your Heart (Single)" (in Japanese). Amazon.co.jp. Archived from the original on January 2, 2011. Retrieved December 2, 2010. "Step by Step (Single)" (in Japanese). Amazon.co.jp. Archived from the original on January 2, 2011. Retrieved December 2, 2010. "迷宮のラヴァーズ (Single)" [Lovers of Labyrinth] (in Japanese). Amazon.co.jp. Archived from the original on January 2, 2011. Retrieved December 2, 2010. "Happy Birthday (Single)" (in Japanese). Amazon.co.jp. Retrieved December 2, 2010. ^ "Detective Conan Theme Songs" (in Japanese). Being Inc. Retrieved May 15, 2010. ^ "B'z、ZARD収録、『名探偵コナン』テーマ曲集第3弾発売". MSN News. August 7, 2008. Archived from the original on August 15, 2008. Retrieved August 15, 2008. ^ "Japanese singer Mai Kuraki claims animation theme songs record for Detective Conan aka Case Closed". Guinness World Records. July 27, 2017. ^ a b "Detective Conan: Shinichi Kudo's Written Challenge official website plot" (in Japanese). Yomiuri Telecasting Corporation. Archived from the original on July 15, 2006. Retrieved March 29, 2011. ^ "Detective Conan Drama 2 DVD" (in Japanese). HMV Group. Archived from the original on March 31, 2011. Retrieved March 31, 2011. ^ "溝端淳平、実写版SPドラマ『名探偵コナン』で"2代目"工藤新一役に抜擢" [Mizohata Juntaira, Detective Conan TV Live action drama, Junpei Mizobata chosen as second generation Kudo] (in Japanese). Oricon. February 9, 2011. Archived from the original on June 2, 2011. Retrieved June 2, 2011. ^ "Kudo Shinichi he no Chosenjo episode 1" (in Japanese). Yomiuri Telecasting Corporation. Retrieved July 11, 2011. ^ "Kudo Shinichi he no Chosenjo episode 13" (in Japanese). Yomiuri Telecasting Corporation. Retrieved October 9, 2011. ^ "Shōnen Magazine, Shōnen Sunday Mark 50th Anniversary". Anime News Network. March 18, 2008. Retrieved November 28, 2010. ^ 名探偵コナン & 金田一少年の事件簿 [Detective Conan & Kindaichi Case Files] (in Japanese). Amazon.co.jp. Retrieved March 26, 2011. ^ 名探偵コナン＆金田一少年の事件簿（12） [Detective Conan & Kindaichi Case Files (12)] (in Japanese). Kodansha. Archived from the original on October 24, 2011. Retrieved March 26, 2011. ^ "VS版　名探偵コナン１" [Detective Conan vol.1 (VS version)] (in Japanese). Amazon.co.jp. Retrieved March 26, 2011. ^ "VS版　名探偵コナン25" [Detective Conan vol.25 (VS version)] (in Japanese). Amazon.co.jp. Retrieved March 26, 2011. ^ "VS版　名探偵コナン　Part II-1" [Detective Conan Part II-1 (VS version)] (in Japanese). Amazon.co.jp. Retrieved March 26, 2011. ^ "VS版　名探偵コナン　Part II-20" [Detective Conan Part II-20 (VS version)] (in Japanese). Amazon.co.jp. Retrieved March 26, 2011. ^ "VS版 名探偵コナン 5つの重要書類1" [Detective Conan 5 important documents File 1 (VS version)] (in Japanese). Amazon.co.jp. Retrieved March 26, 2011. ^ "VS版 名探偵コナン 5つの重要書類5" [Detective Conan 5 important documents (VS version) File 5] (in Japanese). Amazon.co.jp. Retrieved March 26, 2011. ^ 名探偵コナン　ミステリーミュージアム [Detective Conan Mystery Museum] (in Japanese). Amazon.co.jp. Retrieved March 26, 2011. ^ "ラブ・コナン　the movie '09" [Conan, Love the movie '09] (in Japanese). Shogakukan. Archived from the original on October 13, 2012. Retrieved March 26, 2011. ^ 小説 名探偵コナン [Detective Conan novels] (in Japanese). Shogakukan. Retrieved November 28, 2010. ^ スーパーダイジェストブック 名探偵コナン [Detective Conan super digest books] (in Japanese). Shogakukan. Retrieved November 28, 2010. ^ 名探偵コナン推理ファイル　人類の謎 [Detective Conan Mystery Human File] (in Japanese). Shogakukan. Retrieved March 26, 2011. ^ "Detective Conan maze book" (in Japanese). Amazon.co.jp. Retrieved March 26, 2011. ^ "Designer's Journal: Vol. 1". Score Entertainment. Archived from the original on June 3, 2005. Retrieved October 19, 2010. ^ "Case Closed TCG Will Be Uncut". ICv2.com. Archived from the original on January 3, 2011. Retrieved July 21, 2010. ^ "Case Closed TCG". Boardgamegeek. Archived from the original on August 13, 2009. Retrieved October 4, 2009. ^ Kaufield, John; Smith, Jeremy (2006). "Bringing Comic Books, Manga, and Anime to Life". Trading Card Games for Dummies. For Dummies. p. 158. ISBN 978-0-471-75416-9. ^ "The Case Closed Casebook: An Essential Guide". Amazon.com. Retrieved March 6, 2011. ^ "Solve Mystery Cases Together with Detective Conan at Universal Studios in Japan!". Ani.me. ^ "Join Conan at Universal Studios Japan for "Detective Conan: The Escape"". Moshi Moshi Nippon. ^ "2008's Top-Selling Manga in Japan, #1–25". Anime News Network. December 19, 2008. Retrieved October 18, 2010. ^ "Top-Selling Manga in Japan by Volume: 1st Half of 2010". Anime News Network. June 2, 2010. Retrieved October 18, 2010. ^ "Top-Selling Manga in Japan by Series: 2011". Anime News Network. December 1, 2011. Archived from the original on October 13, 2013. Retrieved November 18, 2013. ^ "Top 50 Manga Creators by Sales Since 2010". Anime News Network. August 6, 2011. Archived from the original on October 11, 2011. Retrieved November 18, 2013. ^ "30 Top-Selling Manga in Japan by Series: 2012". Anime News Network. December 3, 2012. Archived from the original on June 18, 2013. Retrieved November 18, 2013. ^ "Top-Selling Manga in Japan by Series: 2013". Anime News Network. December 1, 2013. Retrieved January 1, 2014. ^ "Detective Conan Men in Black vs FBI". Shogakukan Asia. Archived from the original on October 14, 2018. Retrieved October 14, 2018. ^ 小学館漫画賞: 歴代受賞者 [Shogakukan Manga Award: Winners] (in Japanese). Shogakukan. Archived from the original on January 3, 2011. Retrieved December 17, 2009. ^ 【男性編】最終回を迎えてほしくないマンガランキング [(Men's Edition) Which do you not want to see end Manga Poll] (in Japanese). COBS online. January 22, 2011. Archived from the original on January 24, 2011. Retrieved January 23, 2011. ^ 【女性編】最終回を迎えてほしくないマンガランキング [(Women's Edition) Which do you not want to see end Manga Poll] (in Japanese). COBS online. January 22, 2011. Archived from the original on January 24, 2011. Retrieved January 23, 2011. ^ "Spiegelman's 'No Towers' Tops BookScan List". ICv2. October 4, 2004. Retrieved January 1, 2013. ^ "Top 100 Graphic Novels Actual--August 2004". ICv2. September 20, 2004. Retrieved January 1, 2013. ^ "Best Sellers Manga". The New York Times. November 7, 2010. Archived from the original on January 3, 2011. Retrieved December 27, 2010. ^ "Best Seller Manga". The New York Times. May 1, 2011. Retrieved September 30, 2012. ^ "Best Seller Manga". The New York Times. January 29, 2012. Retrieved September 30, 2012. ^ "Compétition officielle — Sélection Jeunesse 2011" [Official Competition — Youth Selection 2011] (in French). Angoulême International Comics Festival. Archived from the original on January 21, 2011. Retrieved January 2, 2011. ^ Eduardo M. Chavez (October 20, 2004). "Case Closed Vol. #01 review". Mania.com. Archived from the original on January 3, 2011. Retrieved December 29, 2009. ^ A. E. Sparrow (December 4, 2007). "Case Closed: Volume 21 Review". IGN. Archived from the original on January 3, 2011. Retrieved December 29, 2009. ^ "Best Continuing Manga of 2010". About.com. Archived from the original on June 10, 2012. Retrieved September 29, 2012. ^ "Japanese Anime TV Ranking, April 23–29". Anime News Network. May 8, 2007. Retrieved December 7, 2010. ^ "Japanese Anime TV Ranking, November 22–28". Anime News Network. December 5, 2010. Retrieved December 7, 2010. ^ 第19回アニメグランプリ [19th Annual Anime Grand Prix]. Animage (in Japanese). June 1997. Archived from the original on January 3, 2011. Retrieved October 16, 2010. ^ 第20回アニメグランプリ [20th Annual Anime Grand Prix]. Animage (in Japanese). June 1998. Archived from the original on January 3, 2011. Retrieved October 16, 2010. ^ 第21回アニメグランプリ [21st Annual Anime Grand Prix]. Animage (in Japanese). June 1999. Archived from the original on January 3, 2011. Retrieved October 16, 2010. ^ 第22回アニメグランプリ [22nd Annual Anime Grand Prix]. Animage (in Japanese). June 2000. Archived from the original on January 3, 2011. Retrieved October 16, 2010. ^ 第23回アニメグランプリ [23rd Annual Anime Grand Prix]. Animage (in Japanese). June 2001. Archived from the original on January 3, 2011. Retrieved October 16, 2010. ^ 第24回アニメグランプリ [24th Annual Anime Grand Prix]. Animage (in Japanese). June 2002. Archived from the original on January 3, 2011. Retrieved October 16, 2010. ^ "More details Regarding Animage Top 100". Anime News Network. January 16, 2001. Retrieved April 27, 2014. ^ "TV Asahi Top 100 anime 2005" (in Japanese). TV Asahi. Archived from the original on August 11, 2006. Retrieved October 9, 2010. ^ "TV Asahi Top 100 Anime (Part 2)". Anime News Network. September 23, 2005. Retrieved December 29, 2009. ^ "TV Asahi Top 100 anime 2006" (in Japanese). TV Asahi. Archived from the original on October 10, 2010. Retrieved October 9, 2010. ^ Keane, Michael (December 14, 2007). Created in China: the great new leap forward. Routledge. ISBN 978-0-415-41614-6. ^ "Tokyo Anime Fair: Award Winners". Anime News Network. March 27, 2006. Retrieved December 17, 2009. ^ "Tokikake Wins "Animation of the Year" at Japanese Academy Awards". Anime News Network. February 20, 2007. Retrieved December 20, 2010. ^ "Tekkonkinkreet Wins Japan's Academy Award for Animation". Anime News Network. February 15, 2008. Retrieved December 20, 2010. ^ "Ponyo, DMC Won Japan Academy Awards on Friday". Anime News Network. February 23, 2009. Retrieved December 20, 2010. ^ "Summer Wars Wins Japan Academy's Animation of the Year". Anime News Network. March 5, 2010. Retrieved March 19, 2011. ^ "Colorful, Arrietty, One Piece Earn Japan Academy Nods". Anime News Network. December 17, 2010. Retrieved December 20, 2010. ^ Sternenberg, Melissa. "Detective Conan Review". THEM Anime. Retrieved November 4, 2012. ^ Campbell, Scott. "CASE CLOSED SEASON 2 – VOL. 2: DEATH WEARS A BLINDFOL (despite the title, the comment is valid for the entire series". activeAnime. Retrieved June 21, 2013. ^ Ellingwood, Holly. "CASE CLOSED 2: CRACKING THE PERFECT ALIBI (CASE 2) [ADVANCE REVIEW] (despite the title, the comment is valid for the entire series". activeAnime. Retrieved June 21, 2013. ^ a b Jeffrey Harris (September 27, 2007). "Case Closed – 3.2: Death Wears a Blindfold DVD Review". IGN. Archived from the original on January 3, 2011. Retrieved December 3, 2010. ^ Carl Kimlinger (December 31, 2006). "DVD 2.1 review". Anime News Network. Archived from the original on January 3, 2011. Retrieved November 28, 2010. ^ Carlo Santos (November 3, 2004). "DVD 1: Secret Life of Jimmy Kudo review". Anime News Network. Archived from the original on January 3, 2011. Retrieved November 28, 2010. ^ Lori Lancaster (September 12, 2008). "Case Closed Season 1 Collection". Mania.com. Archived from the original on January 3, 2011. Retrieved November 28, 2010. ^ Chris Wyatt (May 14, 2007). "Case Closed: The Exploits of Genius DVD review". IGN. Archived from the original on January 3, 2011. Retrieved December 3, 2010. ^ "Detective Conan Helps Kids Fight Crime". Anime News Network. September 18, 2006. Archived from the original on January 3, 2011. ^ "Japanese Government Hires Detective Conan for PR Campaign". Anime News Network. April 9, 2007. Archived from the original on January 3, 2011. Retrieved October 16, 2010. ^ 名探偵コナン-外務省を探る- [Detective Conan Investigates the Ministry of Foreign Affairs] (in Japanese). Ministry of Foreign Affairs (Japan). Archived from the original on January 3, 2011. Retrieved January 28, 2010. ^ "Japan Hires Detective Conan to Introduce World Summit". Anime News Network. April 8, 2008. Archived from the original on January 3, 2011. Retrieved October 16, 2010. ^ 名探偵コナン-サミットガイド- [Detective Conan – Guide to Summit] (in Japanese). Ministry of Foreign Affairs (Japan). Archived from the original on January 3, 2011. Retrieved January 28, 2010. ^ "Detective Conan Special Stamp Collection" (in Japanese). Japan Post. Archived from the original on December 8, 2010. Retrieved December 8, 2010. ^ "Gosho Aoyama's Profile" (in Japanese). Conan-Town.jp. Archived from the original on March 15, 2011. Retrieved March 19, 2011. ^ "Aoyama World" (in Japanese). Conan-Town.jp. Archived from the original on July 22, 2011. Retrieved March 19, 2011. ^ 工藤新一の像 [Shinichi Kudo Statue] (in Japanese). Conan-Town.jp. Archived from the original on 2016-03-03. Retrieved April 3, 2017. ^ コナンの像 [Conan Statue] (in Japanese). Conan-Town.jp. Archived from the original on 2016-03-03. Retrieved January 28, 2010. ^ 大栄小学校 [Taiei Elementary] (in Japanese). Conan-Town.jp. Archived from the original on 2008-04-05. Retrieved April 3, 2017. ^ MATCHA. "Meet Detective Conan In Tottori! Explore The World Of Manga And Anime | MATCHA - JAPAN TRAVEL WEB MAGAZINE". MATCHA - JAPAN TRAVEL WEB MAGAZINE (in Japanese). Retrieved 2018-08-31. ^ McDonald, Andy (2018-08-30). "Conan O'Brien Is Headed To Japan To Visit 'Conan Town'". Huffington Post. Retrieved 2018-08-31. ^ Suk, Sarah (2018-09-07). "Conan O'Brien's showdown in Japan's 'Conan Town' ends peacefully after 1,000-hamburger barbecue". The Japan Times Online. ISSN 0447-5763. Retrieved 2018-09-10. Takuya Furukawa; Tim Gene. DH Publishing Inc, ed. The Case Closed Casebook: An Essential Guide. p. 191. ISBN 1932897305. Conan Drill: The Decipherment of The Conan. 1 May 2003. p. 336. ISBN 4-09-179402-5. Jonathan Clements; Helen McCarthy (2006). Stone Bridge Press, ed. The Anime Encyclopedia. p. 867. ISBN 1845765001. Jason Thompson (2012). Random House, ed. Manga: The Complete Guide. p. 592. ISBN 9780345539441. Wikimedia Commons has media related to Case Closed.